A fun game for highly paid journalists like Laura Kuenssberg in the Westminster bubble. A matter of life or death for real people in the real world. 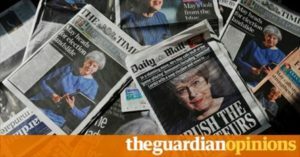 Owen Jones writes in the Guardian: “Britain’s press is not an impartial disseminator of news and information. It is, by and large, a highly sophisticated and aggressive form of political campaigning and lobbying. It uses its extensive muscle to defend our current economic order which, after all, directly benefits the rich moguls who own almost the entire British press. Whether it’s the Sun, the Telegraph, The Times, the Daily Mail or the Daily Express, that means promoting the partisan interests of the Conservative party. The press has been instrumental in upholding the political consensus established by Thatcherism: deregulation, privatisation, low taxes on the rich and weak trade unions. It has traditionally defined what is politically acceptable and palatable in Britain, and ignored, demonised and humiliated individuals and movements which challenge this consensus.